TALLAHASSEE, Fla. (CNS) -- Police being able to stop you for texting while driving, without first observing another violation, is one step closer to becoming law in Florida. But, African American lawmakers worry the change could open the door to harassment by police. State Senator Bobby Powell (D - West Palm Beach) used to be a police dispatcher, and he says he's been on the wrong end of a police stop at night. "I was verbally abused, yelled at, cursed at," Powell said. 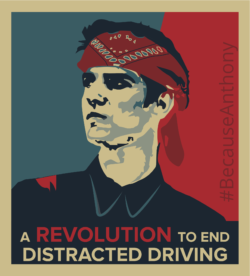 His opposition to stronger anti-texting legislation prompted Demetrius Branca, who's son Anthony died after being hit by a texting driver, to argue the good in the bill outweighs the bad. "If we hesitate now, people are going to die," Branca said. Other parents shared their stories. Sponsor Keith Perry (R - Gainesville) says, in the end, the legislation will send a message. "We're not trying to pull people over," Perry explained, "We're trying to change behavior." Senator Audrey Gibson (D - Jacksonville) was the other "No" vote. She argues requiring hands-free driving takes away the incentive for discrimination to play into who gets stopped. "It's very obvious someone is using a phone when you have hands free," she said. Discrimination is a problem, acknowledge Florida police chiefs, and they're working to stop it. "It's a valid concern, but law enforcement works very hard to implement the appropriate training," said Chief David Perry of the FSU Police Department and the Florida Police Chief's Association. One of the questions asked has been will texting be allowed while stopped at a light? But not while you're driving, unless you want to risk a $30 ticket.